This is towards my super secret Santicore request-- I'm running out of time and I'm kinda drawing a blank so I need to brainstorm with an audience. The actual request was "goblin alchemical mishaps." When I see "goblin" I think, "oh, so it's probably not a player character, but then how will we know about this mishap?" Perhaps evidence of the mishap will be encountered in a dungeon? I suppose you could stretch mishap to mean a weird potion result that players find. But interesting potions would require completely different mechanics than interesting scenes/damaged goblins. 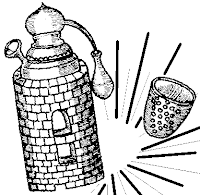 And when I hear "alchemical mishap" I immediately think of an explosion, not a ruined potion. So, I'll forge ahead with the catastrophic accidents angle and leave weird potions for some later potion miscibility table. size: is it like snap crackle pop, or nuke in the dungeon? That's got me several table entries already, I think. The problem with this kind of generating is that I feel like I'm approaching it like an engineer rather than a poet. Maybe letting the reins loose with some associative brainstorming would be good. But I still feel like I need a clear angle, so, "What would be cool for players to encounter as evidence of a past alchemical mishap?" Now I'm realizing I'm drifting from accident scenes to artifacts left over. I could try to push more in that direction. What crap do alchemists work with/on? Now I'm thinking that I haven't really dealt with the adjective "goblin" yet. I'm guessing that means they will be kooky, ne'erdowells sort of like tinker gnomes always messing stuff up. Adds a bit of humor. Not really to my gaming taste, but if I think of them more as gremlins-- being in blenders, electrocuting themselves-- maybe that more sinister angle I can do. I think I might use this as an entry point for some more brainstorming tomorrow. If you're going from gremlins, why not go all the way? 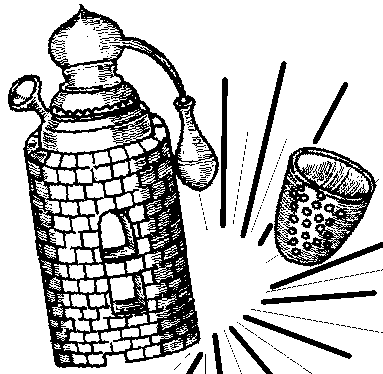 They could brew alchemical items that create mishaps, engineering accidents for their perverse pleasures. Another thought would be that goblins are created from alchemical mishaps, each uniquely mutated little monstrosities. I'm specifically thinking of the vat-born in Dying Earth. goblin says stringpunk to me: improvised, jury-rigged, unstable mayhem. Alchemical means things in the process of transformation, maybe endlessly. Combining essences to make new essences, novel elements - breaking the laws we all know, of combination or sympathy, to make something unanticipated. I like the tiny planets: makes me think of accidentally creating a whole new universe or set of planes. Mr Zarniwoop is on an intergalactic cruise in his office. What "goblin" alchemy conjures up to me is cheap materials. No realgar, cinnabar, mercury, or orpiment for these guys ... they work wonders with swamp mud, toe fungus, burnt straw, and snail slime. Maybe focusing on a specific scenario would help? The goblin works for the wizard in his tower, perhaps as an apprentice. The wizard is away on vacation for a week and the goblin knows that to contact or disturb him is a death sentence. All he's supposed to be doing is cleaning the floors, watering the plants, and feeding the "things" downstairs. Easy enough. While he has the front door open to sweep out some dirt, this adventuring party suddenly bursts in then slams and bars the door shut behind them. They have piles of gold, magic weapons, and a pissed-off dragon hot on their trail. They could probably win the battle if only they could survive the flames. They need fire resistance potions, NOW! The tower's wards are only going to hold for so long as the dragon attempts tear it apart. The little green dude is HIGHLY motivated. He's watched the wizard do this "hundreds of times, or was it three times? I get numbers mixed up". The lab equipment and unlabeled ingredients are all here. That particular formula with the wizard's peculiar scribbles in the margins is the third scroll on the fifth shelf... or was it the fifth scroll on the third shelf? With the party helping him there is some slight chance of success. Your chart covers everything else. The problem with this kind of generating is that I feel like I'm approaching it like an engineer rather than a poet. Maybe letting the reins loose with some associative brainstorming would be good. But I still feel like I need a clear angle, so, "What would be cool for players to encounter as evidence of a past alchemical mishap?" My method of brainstorming is pretty haphazard. I start by looking over some sources of inspiration and writing down any seeds of ideas that I can steal or that I come up with by association. In your case, I might look over the spell lists, the potion lists, the alchemical equipment list in the DMG and just make a note of any of those entries I think has potential. Then I look at each idea individually and try to develop it into something that matches my purposes and will be entertaining. So, for example, looking at the magic-user spell list, on the first page I see the spell Enlarge. I can split that up into Enlarge and Reduce. My immediate thoughts are of some kind of super-engorged, immobile, possibly all-devouring gobln - I write that down - and lots of little goblins; maybe one goblin that turned into lots of little ones? A goblin that splits in half when struck like an ochre jelly? Goblins that mitose in response to loud noises? I write that down too. Then I think about ways to make those things usable encounters for the players. I keep trying to develop the idea until I get something usable and relevant or I get stuck, then I move on to the next one. If an idea doesn't fit the requirements - not "goblin" enough, not "alchemical" enough, not a usable encounter in itself - I try to combine it with another undeveloped idea that does. The downside for me is that if I don't have any inspirational material to work from, I tend to get stuck. But it looks like you've already got that covered with your approach. Fun stuff. Alchemy deserves more OS love. Sorry for the lack of response, couple long days at work. I'll try to respond in the AM with some coffee and a fresh mind. @rjp: That's the tough part, you could take the request in several different directions. I think where I'm tending now is not vatborn, but goblins scarred and warped by accidents. @Richard & Roger: Yes, I think you're right, stringpunk with cheap funky materials. It seems like this blends into hedge witchcraft for me, that my idea of alchemy is more erudite and wonderous. @Quibish: thanks, sure, in that situation the chart could focus on bad things that happen to the goblin while mixing, or bad things that happen to the party after drinking the results. I think that was my main hang up; which to focus on. @John: Don't take my criticism of the engineer approach too strongly, I think both it and the more associative approach have advantages and disadvantages. Your example of looking at the spell lists is a great one-- lots of proven magical effects for possibilities and then when you flip the enlarge to reduce is where I see the engineer come in looking for patterns. Opposites is a good easy way to come up with new ideas. I'd probably start looking for other patterns in the spells like: elements, the schools of magic, affecting self, other, area of effect, etc. @Theodoric: I think once I got this chart done there will be lots of spooloding going on.